Prodrive has developed a system capable of altering the toe angle of a vehicle's rear wheels on the fly. Active Toe Control works with twist beam axles, offering the performance of more expensive multilink rear suspension at less than half the cost. By using a control rod to adjust the angle of the rear wheels relative to a vehicle's body, Active Toe Control can apply more toe-out at low speeds to boost maneuverability, while at high speeds it adjusts for more toe-in to improve stability. This means the handling characteristics of a front wheel drive vehicle will be adjustable simply by altering algorithms in the on board computer. Prodrive is currently seeking a hardware partner to produce a working prototype. Motorsport and vehicle technology specialist, Prodrive, is developing a vehicle dynamics system that actively adjusts toe angle to improve vehicle handling. Known as Active Toe Control, it works on the rear axle of front wheel drive cars to optimise the toe angle, depending on the speed of the vehicle. This helps overcome the static toe compromise of either giving a vehicle agile handling at lower speeds or making it more stable and predictable at high speed. Advances in tyre technology and suspension, mean that the dynamic capability of modern cars is now so good, that it is rare for drivers to ever reach a vehicle's limits. "Typically most drivers stay well within 60-70 per cent of their car's capabilities," said Matt Taylor, Prodrive chief dynamics specialist. "This means vehicle manufacturers are increasingly focusing on making their cars feel more sporty in this region, without necessarily increasing their outright performance." Once the chassis and suspension designs have been completed on a new model, the final adjustment to refine the dynamic characteristics is typically to set the static toe angles. To give a vehicle additional low speed agility, the wheels usually have up to a degree of toe‑out at the rear axle, while to make a car more stable at higher speeds, for emergency manoeuvres like a lane change, then toe-in is preferred. This makes any fixed toe setting a compromise and one that has contributed to the increasing use of complex multi-link rear suspensions in mid-size hatchbacks; a design previously reserved for high end vehicles. Ford set the trend with the Focus and others have since followed suit. However, while they work extremely well, such rear axles are far more expensive than the traditional twist beams they replace. "Vehicle manufacturers really want ways to reduce the production cost of their cars. Replacing simple twist beam axles with more expensive multi-link systems goes against the grain, but as they all strive for class leading handling, it is direction they are being forced to take," said Taylor. "Active Toe Control, fitted to an existing twist beam axle, can give many of the dynamic benefits of a multi-link system, but at less than half the cost." Handling characteristics are increasingly becoming attributes of vehicle brands. A BMW drives differently to a Renault, which is different to a Ford and in different markets there are differing expectations on how a car should handle. The German market tends to like the handling characteristics typical of a rear wheel drive car where the vehicle's yaw rate and lateral acceleration build at the same time. "You don't get the feeling of the car rotating, rather that the car is being pushed sideways. People often describe this as if the rear wheels are following the front wheels, with the car turning around the rear axle," said Taylor. Cars with this tight lateral acceleration and yaw rate phasing tend to turn in well and it is a typical set up for competition cars. Markets, like France, which have been dominated by front wheel drive cars, favour different characteristics. 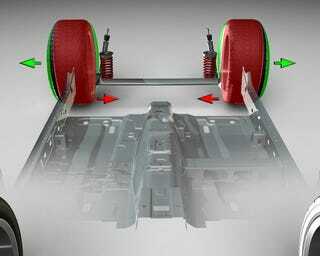 Here they are used to cars where the lateral acceleration lags behind the yaw rate gain, a common characteristic of twist beam suspensions where the suspension flexibility allows the rear wheels to move sideways before 'pushing' the rear of the car. "This gives the driver the sensation that the car is momentarily turning on the spot around its centre of gravity, as the nose tucks in and the back kicks out, giving an agile feeling," said Taylor. "Neither approach is right or wrong, it's a matter of preference. With Active Toe Control you have the added benefit of refining the handling simply by changing the control algorithms on the production line or at the dealer, to give the characteristics favoured by whichever market the car is to be sold." Prodrive has identified a preferred mechanism design to adjust the toe angle and is looking for a hardware partner to take the project to a working prototype.